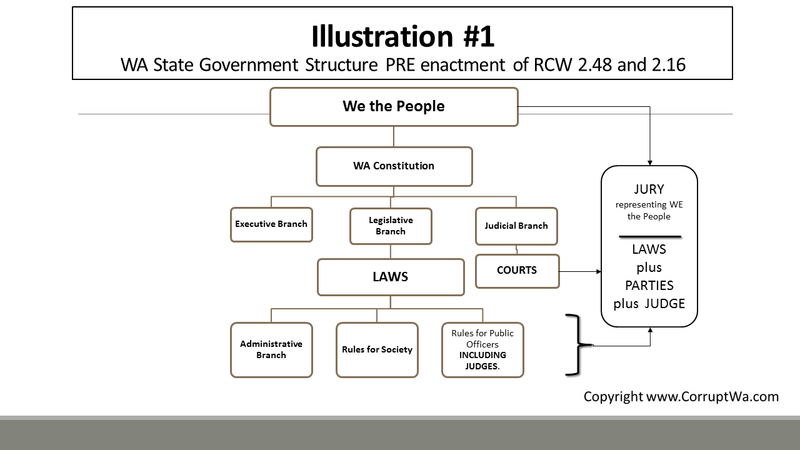 In a complaint filed in US Federal Court for the Western District of WA, activist and plaintiff, Bill Scheidler presents the WA State Bar’s RICO enterprise in a “nutshell version” and in a “long version” that includes diagrams, 1000’s of pages of case histories, dozens of grievances filed with the WA Bar against lawyers for their misconduct and dismissed by the Bar, and grievances filed with the Commission on Judicial Conduct [CJC] against judges for violations of law and their code of conduct that are also dismissed by the CJC as evidence of massive corruption. This action is precedent setting. 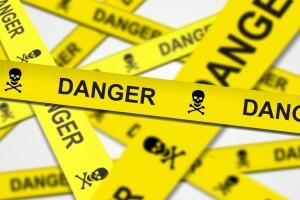 It involves the highest levels of the WA Judicial System and the self-policing WA State Bar association, including the Supreme Court Judges and other Judges, Prosecutors, and Private Attorney at Law, all tied together through the WA State Bar Association and committing crimes with impunity against victims in various combinations of legal abuse schemes utilizing the courts and other agencies controlled by WA State Bar lawyers to aid and abet. The racketeering conspiracy and anti-trust activity is witnessed and experienced first-hand by Plaintiff and countless other victims of this enterprise throughout the State of WA. It is masterminded at the highest levels of WA State Bar association. Bar associates-in-fact, coming from various public and private domains, have created a RICO enterprise that now dominates and controls the WA State Bar’s disciplinary functions, which in turn controls the market for attorneys in WA by taking attorneys out of the market who advocate ‘unpopular’ causes, which affect individuals, businesses and interstate commerce. The extent of the Bar’s criminal conduct includes, but is not limited to, insurance fraud through case fixing; kidnapping through case fixing under color of child protective services; human trafficking and even “murder by neglect” through case fixing under color of guardianships; Conspiracy; Extortion; and false imprisonment through case fixing. 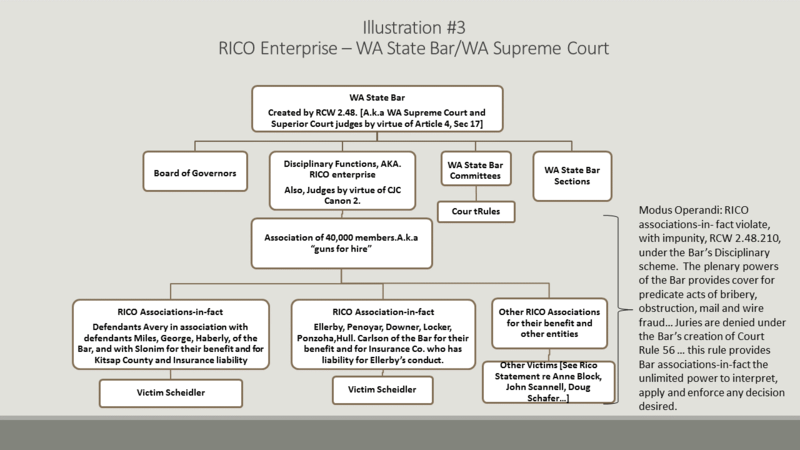 In a nutshell WA State’s judicial system is polluted by Bar sanctioned RICO associations-in-fact, being under the protection of the WSBA’s disciplinary schemes so lawyers at the helm of these ‘associations-in fact’ can violate their solemn oath to tell the truth, to conduct themselves with honor, and to never seek to mislead a judge or jury – mandated by law, RCW 2.48.210– in order to carry out their criminal schemes. Scheidler goes on to give his ‘first-hand’ experience in how Bar Associates, betray their oath for the sake of the almighty dollar. Our “JUSTICE SYSTEM” only functions as a “JUSTICE SYSTEM” if lawyers and judges abide by the laws that define their authority and abide by the codes that define their ethical obligations and conduct. The WA State Bar [WSBA] and the Commission on Judicial Conduct [CJC] are the ‘state agencies’ that are suppose to insure the integrity of our “justice system”. Both agencies are under the WA State Supreme Court. The problem is this …. all WA State judges, including judges on the WA State Supreme Court, MUST be members of the WSBA. In other words, WA’s entire judicial branch is run by Bar Associates — the FOX is guarding the HEN HOUSE. 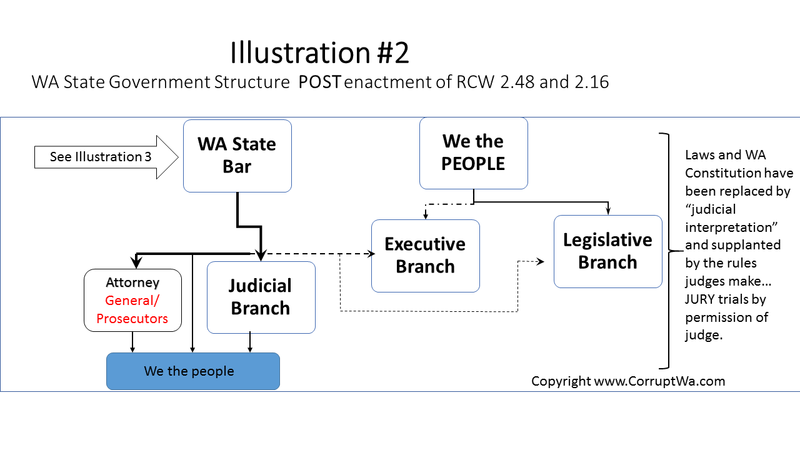 This “take over” of WA State’s judicial branch, by Bar Associates, is the reason neither the WA State Bar nor the Commission on Judicial Conduct are doing their job in “regulating” lawyers and judges. Rather the opposite is the norm, the WSBA and CJC, have abandoned their obligations to society and are now a protection racket for the benefit of lawyers and judges. It is proof of the adage, “Power corrupts and absolute power corrupts absolutely.” It is that simple!!!! Scheidler, and others, who recognize the racketeering by lawyers and judges who routinely use WA State Courts to commit crimes against the people, asked, repeatedly, representatives Matt Shea, David Taylor (who are both lawyers and legislators), Jesse Young, and Michelle Caldier, and Senators Jan Angel and Steve O’Ban (another lawyer/legislator), to INVESTIGATE the criminal conduct by lawyers and judges occurring in the courts. However these legislators are either too stupid or too cowardly to act. And in the case of the “lawyer/legislators” like Matt Shea, Taylor, O’Ban … maybe the refusal to address ‘legal corruption’ is too close to home. One thing is for fact… trying to move Senator Jan Angel to investigate legal corruption, it seems that the “lawyers” in the legislature who advise legislators in their duty have told Jan that she has NO OBLIGATION to act on Scheidler’s complaints. J. Reiko Callner, Executive Director of the CJC, and against Felice Congalton, Associate Director of the WSBA. Both Callner and Congalton are members of the WA State Bar and are near the core of WA State’s corruption. However the lawsuit, which Scheidler instituted under his statutory right granted by RCW 7.56, was dismissed by Jennifer Forbes, judge of Kitsap Supreior Court. Of course, Forbes is a member of the WSBA … and the WSBA is a defendant — Forbes is in clear conflict with the issues and parties. Scheidler says that his lawsuit against the WSBA and CJC that was dismissed by Forbes, a WSBA associate serving as judge, is, on its face, proof of the corruption. Scheidler says Jennifer Forbes violated the law, RCW 2.28.030, by serving as judge on a case in which she, as a WSBA associate, has direct interests. Scheidler claims Forbes willfully violated RCW 2.28.030 and committed a GROSS MISDEMEANOR act in addition to her violation of Canon 2 of the ethical rules that judges are suppose to abide. Because Forbes’ dismissal of Scheidler’s case against Callner and Congalton was an unlawful act, Scheidler filed a motion to reinstate the case. Kitsap County Court Administrator/or Presiding judge, assigned the case to Judge Keith Harper — another WSBA associate! Simply another criminal act. Keith Harper DENIED Scheidler’s motion by stating — you want a fair venue maybe the moon or mars…”. Scheidler filed a grievance with the CJC against Forbes and Harper for their violations of law and rules of conduct. And of course the CJC, where J. Reiko Callner is director, refused to act on the grievance. Said another way, Callner and the CJC protects all the judges and the judges protect Callner and the CJC. THIS is EXACTLY contrary to the purposes of the courts and the CJC. The criminal conduct occurring within the courts is THIS EVIDENT and this BLATANT … In WA State, WE HAVE RACKETEERING not REGULATION. When judges commit crimes from the bench and the CJC refuses to act on this blatant criminal conduct we don’t have “justice” in WA — WE HAVE RACKETEERING. And the corruption leads right up to the WA State Supreme Court. The question still remains … how does a citizen file a complaint against those that commit crimes if those that commit the crimes are the ones who adjudge the process? Next One MAN vows his life, his family’s life to a “JURY”! Oregon posts all attorney complaints for public review not just those deemed punishable.